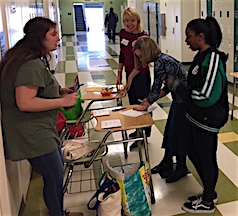 Welcome to the new Arlington League of Woman Voters newsletter, The Arlington League in Action, archived here and filled with information on events and volunteer needs and news alerts! It will be another place to go to find out how you can become involved, meet and mingle with fellow League members, or find an educational event. 2018 Newsletters and News Releases may be found here. 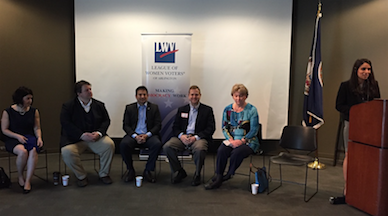 17 April Edition announces the creation of LWV-Arl’s radio program, a reminder of the 1 May Annual Meeting and 75th Anniversary Celebration, and the 2019 Election Debates Schedule. 3 April Edition calls for volunteers for summer voter Registrations. as we expand to Fairs, Farmers Markets and announces our new Condominium Outreach Program. It also reports information on our 3 Candidate Debates and the LWV Nations Capital Annual convention 4 May… and much more. 20 Mar Edition: Registration links for “The Power of Black Women Voters” presentation, the April and May candidate debates, and committee meetings are included in this edition. 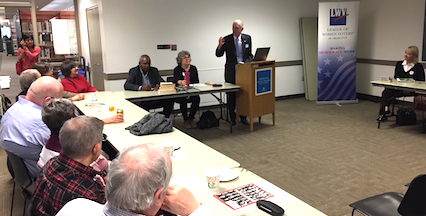 6 Mar Edition: publishes the speaker for our Annual Membership Meeting 1 June, asks for volunteers to plan candidate forums, and dates for several state-wide and Washington D. C. area meetings. 20 Feb Edition: reminds us of the “Money in Politics “ discussion this Saturday, need for volunteers for the High School Registration Campaign, and a list of up-coming committee meetings. 6 Feb Edition: alerts us to our 75th Anniversary Celebration on 1 June and the 100th Anniversary of the creation of the League and passage of the 19th Amendment; the call for volunteers to join the High School Voter Registration Campaign; and 23 February presentation, “Money in Politics” featuring former Republican Congressman Tom Davis and former DOJ prosecutor Gene Rossi. 16 Jan Edition: calls for Day of Action write letters, sign petitions, and make our voices heard at Central Library on 19 Jan and in Richmond on 6 Feb, the day set aside for us to lobby our General Assembly Senators and Delegates. 2 Jan Edition: invites us to begin advocacy immediately by attending the League’s Pre-legislation Meeting with our state delegates and sends an invitation to 16-26 year-olds to join the League; and a call for each of us to join one of the chapter’s standing committees. 5 April - Announcing the Post Legislative Forum: an analysis of the 2019 session of the Virginia General Assembly with Arlington delegates and state senators and a link to reserve a seat. 28 February - The League of Women Voters of Virginia Applauds the General Assembly’s Bipartisan Redistricting Commission Framework. 16 January - Announcing our 75th Anniversary as a nonpartisan political organization. 2 January - A call by the Arlington County Board for our Virginia State legislators to pass the ERA.